Please note that the content of this book primarily consists of articles available from Wikipedia or other free sources online. 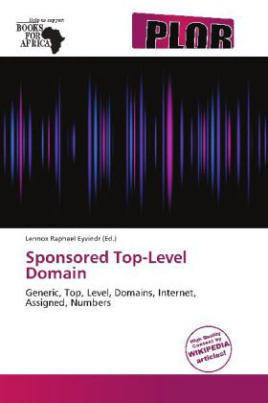 A sponsored top-level domain (sTLD) is one of the categories of top-level domains (TLDs) maintained by the Internet Assigned Numbers Authority (IANA) for use in the Domain Name System of the Internet.A sponsored TLD is a specialized top-level domain that has a sponsor representing a specific community served by the domain. The communities involved are based on ethnic, geographical, professional, technical or other theme concepts proposed by private agencies or organizations that establish and enforce rules restricting the eligibility of registrants to use the TLD. For example, the .aero TLD is sponsored by SITA, which limits registrations to members of the air-transport industry.